Andy Weir’s The Martian gets the science right but leaves out what matters most. When Ridley Scott’s exciting and funny film of Andy Weir’s hit novel The Martian comes to theaters this week, it’s going to be wildly popular and make hundreds of millions of dollars. Or let’s be more precise: According to the Congressional Research Service there were 6.2 million scientists and engineers in the United States in 2012, and that workforce is growing at a compound annual rate of 1.5 percent, suggesting that in 2015, that number is about 6.485 million. Each of those scientists and engineers will see the movie twice. The average price of a movie ticket in the United States is $8.61, but that average includes children’s prices and 2-D movies; it’s safe to say that most scientists and engineers will pay a premium to see The Martian in three glorious dimensions. Set that average ticket price at a conservative $12, and that gives us a domestic box office gross of $155,640,000. That’s just an estimate, of course; I didn’t account for the preponderance of scientists and engineers in coastal states where ticket prices tend to be higher. Also, it’s possible that some nonscientists will see this movie. I’m poking fun! Tons of nonscientists will see this movie, and will love it. I’m a nonscientist, and I loved it—which surprised me, because I found Weir’s novel utterly exasperating. I expected that the filmmakers would dial back the book’s chief flaw: its fanatic need to show its work, which led to pages of calculations not unlike the ones I just undertook, not-quite-dramatized scenes of astronauts and orbital dynamicists and jet-propulsion engineers “working the problem.” And they did; Drew Goddard’s sharp screenplay balanced those scenes with both dramatic setbacks and light comedy, transforming Weir’s story into a thrilling adventure that uses scientific ingenuity to animate character and plot, rather than to replace them. That is: The Martian the movie is science fiction. The Martian the book is fictional science. But the film also moved me, which I wasn’t expecting. And the ways it hints at the wonder of space travel revealed something I never even realized was missing from Weir’s novel. He’s a reader who cares, truly cares, if the science in his book checks out. He cares more about that, perhaps, than about whether the characters in a book feel real or compelling. Good news for him: The science in The Martian checks out. (Weir, a software engineer, famously published the book in installments on his own website, correcting errors as he went along thanks to helpful readers who wrote in when his calculations were off.) As Mark Watney, the novel’s astronaut-botanist hero, solves problem after problem—growing potatoes in Mars soil, transforming his urine into rocket fuel—I came to think of The Martian less as a novel in the traditional sense than as an expertly assembled sequence of causes and effects, actions and reactions, hypotheses and conclusions. And though I sometimes got exhausted by the book’s exhaustiveness, I also know that people read and enjoy books for lots of different reasons. If you—like the stick figure in the xkcd cartoon—are interested in a book whose narrative is propelled by thermodynamics, not character, you probably won’t mind if the hero is a stick figure too. And is he ever. Mark Watney’s chipper recounting of his travails 150 million miles from home is heavy on the practical and light on the psychological. He tells jokes, he feels bad about his parents and his fellow crewmembers, he wants to live. In lieu of giving us a glimpse of Watney’s emotional life, Weir has a NASA psychologist appear on a CNN talk show to deliver her professional assessment. (This read so near to parody—the book’s ethos of telling, not showing, exaggerated to the point of absurdity—that I laughed aloud.) Watney describes the most terrifying moment of his life—the moment he learns that his fellow astronauts have departed in the Mars Ascent Vehicle, leaving him and the Mars Habitat alone on the planet’s surface—like so: “The Hab was intact (yay!) and the MAV was gone (boo! ).” That’s not something someone would say—it’s human emotion stripped down to binary code. The result is a novel that encourages skimming. Skim through the pages-long calculation of the calorie count of a Martian potato field. Skim through Mark’s explanation of why he’s replacing the energy use measurement “kilowatt-hours per sol” with the easier-to-say “pirate-ninjas.” (That might be the moment at which The Martian most precisely resembles a not-great xkcd strip.) Skim, even, through the occasional exploding rocket or rolled-over Mars Rover. It’s all delivered in the same easy tone, given the same weight. There’s nothing in The Martian to slow a reader down. And the movie, for the most part, zips along engagingly at a level similarly close to the surface. There are no long disquisitions on the meaning of it all. 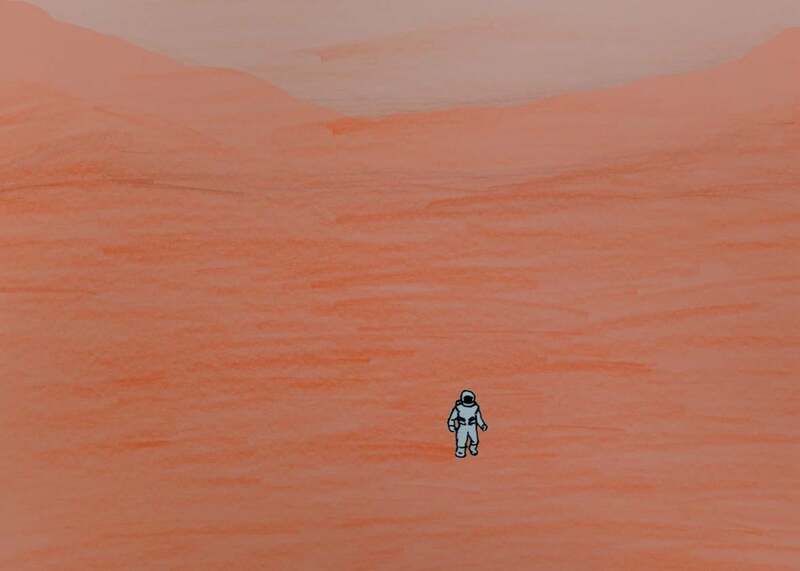 Mark Watney is not given a dead-child backstory. But Ridley Scott has tools Andy Weir doesn’t: He has Matt Damon’s face, which in its expressiveness in moments of action connects us emotionally to Watney. And he has the power of a beautiful image: Scott frequently cuts to gorgeous FX shots of a tiny Watney amidst the immensity of the planet on which he’s trapped. These moments slow us down and allow us to consider Watney’s predicament, and the literally otherworldly place human folly has left him. And that, I’ve realized, is what frustrated me about the novel The Martian, way more than long scientific disquisitions or thin characterization: the way it disregards the ineffable. Space, to Mark Watney and the book’s other characters, isn’t vast or unknowable or terrifying or awe-inspiring. Space is merely a series of problems to be solved—different from the problems one faces on Earth due to transmission delay and lack of oxygen, but nonetheless solvable with some math and a little elbow grease. Late in the book, as Watney faces one of his final challenges, two of his crewmates discuss the odds against him. “Have faith,” Rick Martinez tells his commander, Melissa Lewis. “You know I’m not religious,” she replies. We know Rick is Catholic, because Watney used the wood in his crucifix to start a crucial fire in the otherwise fireproof Mars Habitat. We might think, for a moment, that Rick is about to dive a little deeper into this question. But as Watney drove his jerry-rigged rover across a vast Martian plain, giant Aresian tornadoes twisting slowly in the far distance, the movie gave me room and time to goggle just a little at the incomprehensible foreverness of our universe. That’s not the book’s game, and though it’s remarkably successful at what it sets out to do, I mourn, a little, the missed opportunity in what is turning out to be a generation’s defining work of science fiction. Andy Weir’s The Martian is set far, far away, but avoids the long view. It’s a novel about outer space that never gives even a moment to the concept of the infinite. After all, adding infinity can really screw up an equation. The Martian by Andy Weir. Broadway Books.